New HDR algorithms help you obtain the right exposure settings intelligently, according to lighting conditions. Overexposed or dark areas are processed for more natural transitions between highlights and shadows, while DSP acceleration allows for more efficient shooting. 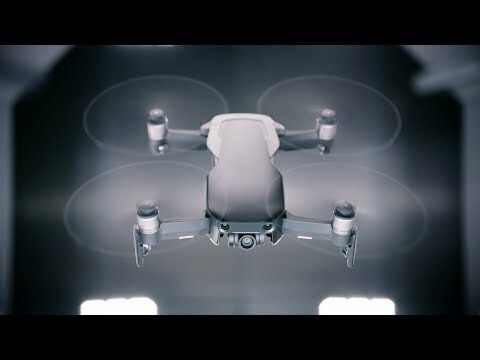 12 MP Stills: The Mavic Air’s onboard camera integrates a 1/2.3” 12-megapixel CMOS sensor and an f/2.8 lens with a 35-mm equivalent focal length of 24 mm to shoot high-quality photos and videos. 8 GB Internal Storage: In addition to a Micro SD card slot, 8 GB of internal storage let you save photos and videos directly to the aircraft and export files through its USB 3.0. Type-C port. The dedicated remote controller uses a foldable, low-profile, ergonomic design to hold your smartphone for maximum convenience. Detachable control sticks store inside the remote controller to pack more comfortably on the go. Intelligent & Intuitive. If you want to focus on just your shot, select TapFly in DJI GO 4, which lets you fly wherever you tap on your mobile device screen. TapFly works in Forward, Backward, Free, and Coordinate modes, and you can adjust flight speed to suit all your aerial needs. Flight Safety. FlightAutonomy 2.0. Using advanced VIO technology, the powerful sensor system in FlightAutonomy 2.0 consists of a primary gimbal camera, forward, backward, and downward dual-vision sensors, downward infrared sensing system, IMU redundancies, and a group of computing cores. Together, they collect and transmit information from the surrounding environment to the high-performance processor for more precise hovering and better flight performance. Advanced Pilot Assistance Systems (APAS) allow the aircraft to bypass obstacles in front of and behind it actively. Your grand adventures of discovery have never been so safe and easy. Max Flight Time: 21 min. FOC ESCs and Propulsion. 68.4 kph. Enhanced Wi-Fi Video Transmission. 2x RC cable holder (small). Connection cable (USB 3.0 - USB-C). Battery to power bank adapter.